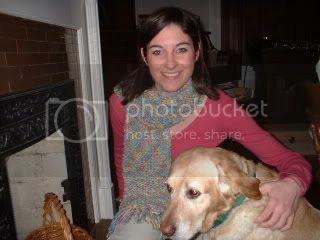 Here's Cate (and Irish) modeling her recently completed Landscapes scarf. Good job Cate! Very cute! Landscapes is a fun yarn. You have to love the colors. I think Cate has mastered the garter stitch... and it's time to move on. Maybe mittens next?